Together we struggle. Together we succeed. I took my 19-month-old son to the Seattle LGBT Pride Parade this past Sunday. If you’ve never been to one, it’s quite possibly the most wonderful and moving parade you’ll ever see. Thousands of people gathered to celebrate pride, happiness, love, and this year, victory. Not less than 48 hours prior the US Supreme Court had declared gay marriage a fundamental right to all Americans, so this parade had the same kind of exuberant, victorious joy similar to when my beloved Blackhawks won the Stanley Cup. I felt it was of the utmost importance not only that I attend, but that I provide the opportunity for my son to attend as well. How did he like it, you ask? Well, to put it simply, he loved it. All the marching bands, costumes, floats rocking out to good music, fire trucks, police cars, motorcycles, and happy, dancing, joyous people. 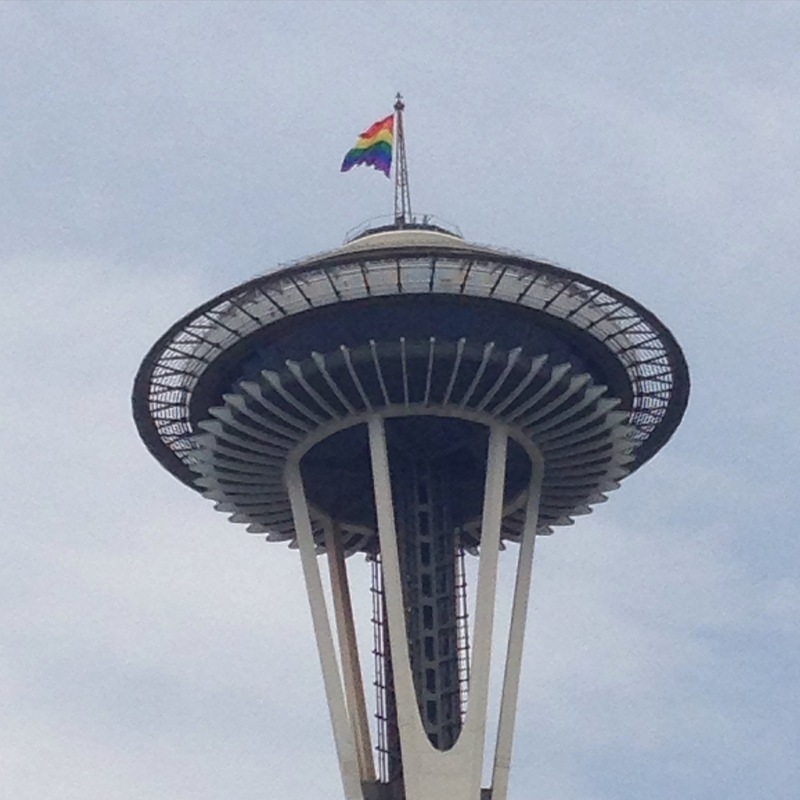 And I was moved to tears with the unbelievable amount of LBGT support from all facets of humanity – the Seattle police and fire departments, public works, parks & recreation, mayor’s office, local businesses such as T-Mobile, Starbucks, Chipotle, Alaska Airlines, BECU, even the Boy Scouts of America. That one got me right in the feels. You see all these people? All these smiling and happy people? They come together once a year to celebrate something truly special – the continued progress of earning the basic rights and respect of humanity. Ideally we wouldn’t have to celebrate this because happiness, respect, and dignity are all fundamental rights that everyone has, and we should all treat everyone as we want to be treated. But sometimes people don’t like others simply because they are different, and that is not okay. So even though they are different from us, it is our duty to be their advocates, to support them, accept them, and love they for who they are. And I want you to know that I will do the same for you, always. You are my child. I’m proud of you and I love you just the way you are. With all the articles about the “Terrible Twos”, “Toddler Meltdowns”, and other crazy (but absolutely true) stuff, I figured it was time to spin it the other way. Time for another Top Ten! 1) He understands what I say. Oh boy, does he understand what I say. One of the most frustrating things about his infancy was the natural communication and understanding gap. But now? I can talk to him like an adult and he gets it, even if he can’t articulate it. One one hand that’s amazing, but on the other hand it’s made me check myself and analyze my words like I never have before. 2) Words words words. You can practically see the wheels turning in his head as he learns to associate things with the words we say and the names we call them. And when the new words come out? It’s like a tiny little candy hearts exploded and melted in my chest. And the rate at which he’s picking them up now is astounding. Here are some (probably not all) that he knows, more for record-keeping but possibly for your enjoyment too: Up, down, ball, rabbit, fox, socks, shoes, broccoli, potato, bathroom, cheese, cookie, water, rock, teeth, mama, dada, papa (grandpa), uh oh, balloon, vacuum. 3) Singing!! Yep, that’s right! Apparently one of his favorite (or at least most memorable) songs from Music Together class is a song called “Me, You, We”. And my wife caught him singing it to himself one day!! Since then he’ll sing it every once and awhile, but the fact that he caught on and can sing it? Unbelievably cool. 4) He’s an outdoor kid. So far, he seems content with playing outside as long as possible and protesting when it’s time to come in for a nap. This bodes well for the future where I see him as I saw myself in childhood – playing outside until called home for dinner or until the sun went down. That’s one of the main reasons why we moved to the Pacific Northwest: more outdoor opportunities. So it’s slides, parks, play structures, nature trail walks, and wagon rides until the cows come home. This will just get more and more fun as he gets older. 7) Hugs & cuddles. He’s an affectionate boy. I love it. I’ll never force him to kiss or hug anyone he doesn’t want to (related or not), but I know there may be a time where he doesn’t want to be as affectionate (“Ew, dad, gross!”). So for now I’ll soak up every hug, cuddle, and Eskimo kiss I get. 8) Motor skills. Everything from climbing to looking under couches and beds to dipping french fries in ketchup. His skills are accelerating at a breakneck pace. “Child proofing” is an ever evolving practice where I feel I’m at least 2 steps behind him. 9) Music class! We’ve been going to Music Together class since he was 2 months old, and while he’s always seemed to enjoy it, it’s only in the last month or so that he’s really blossoming into it. Dancing, hand motions, drum playing, it’s all happening now. And I can’t get enough. 10) We’re not done yet. Not by a long shot. Here’s to whatever the future will bring. I love this kid.